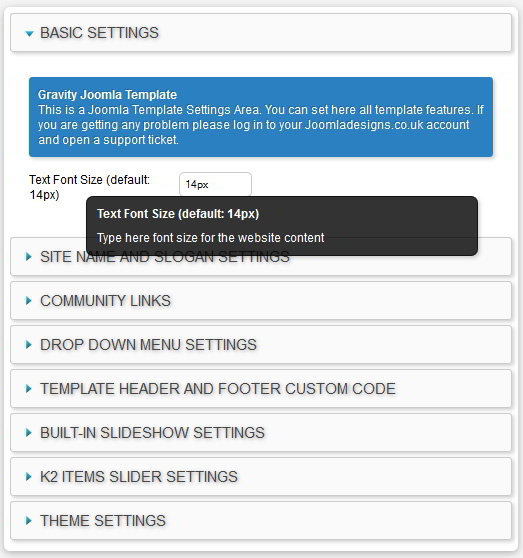 The user friendly template control allows you to access and update all the settings, built-in features we have incorporated into the Joomla templates we have developed at the website. We have also split the control panel up into different tabs to make it easier for you to access the settings and features. 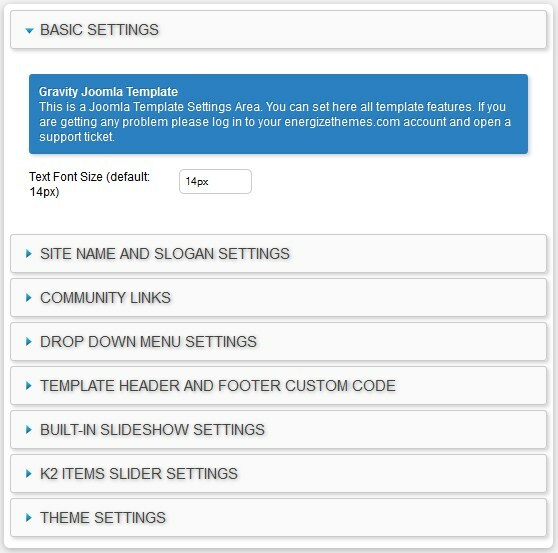 From the site name and slogan settings tab you can change all the settings for the header area of the template. The community links tab includes all the settings to enable or disable the icons and links for the social network sites including Facebook, Twitter, Google+ and much more. 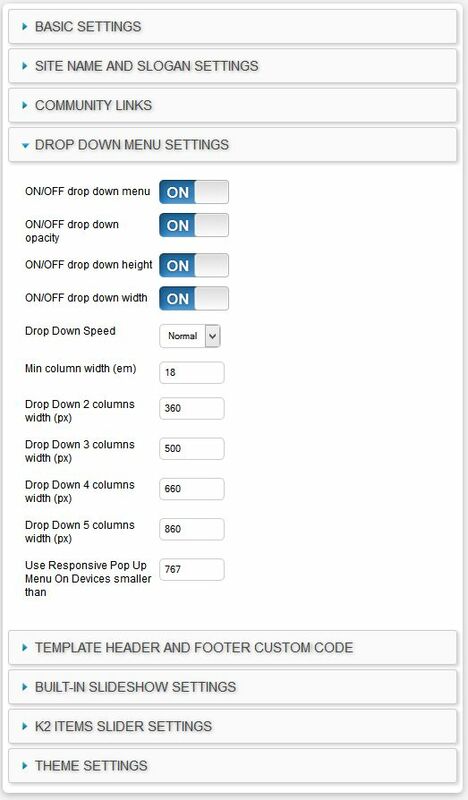 The drop down menu settings tab allows you to easily change the settings for the drop down menu items which appear in the top menu of your website. From the built-in slideshow setting tab you can change all the settings we have included in the slideshow for the template. A number of the Joomla templates we have created at the website include support for the very popular K2 Joomla extension. 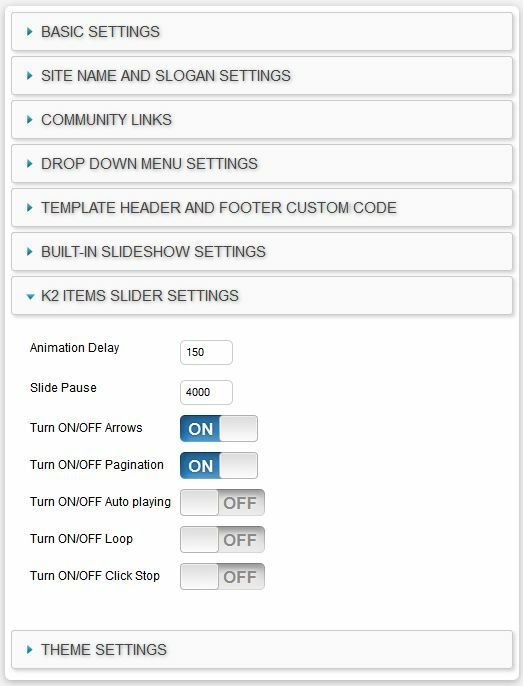 If the template includes support for the K2 extension the K2 Items slider settings tab will appear in the control panel. The theme settings tab includes all the settings which allows you to easily customize the template color scheme to suit your exact needs. The theme settings option gives you a lot more freedom, control and flexibility to customize the template without touching any CSS code or any other code included in the design. This is great feature for people who don’t have the design skills or just want to quickly customize the design to fit their needs. 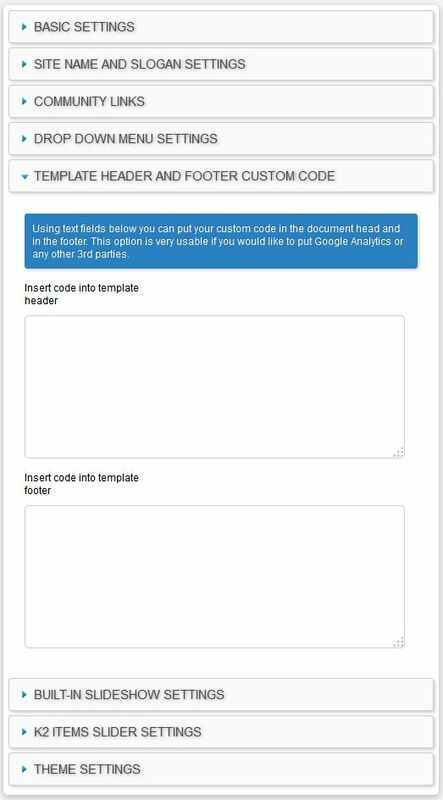 Change the background images by uploading your own image for some of the modules included in the template. Turn the built-in theme option from off to on. If you want to use one of the built-in theme styles which comes supplied with the template then this option needs to be set to on. If you want to create your own, custom theme using the color picker customization tool then this option needs to be turned to off. Using the color customization tool you can change almost every part of the designs color scheme by just clicking on the one of the color picker options next to the area of the template you would like to change. We have tried to include as much information as possible to help you understand how each setting included in the control panel works. To access the help tips open one of the control panel tabs and hover your mouse over the text next to each setting. A pop help tip as show in the screen below will now appear to give you more information about how to use the setting included in the control panel. Click the Save button which will save all the changes but keep the control panel open. This is useful if you are customizing the template color scheme using the built-in color picker tool and what to preview the changes at the site as you select different colors. Click the Save & Close button which will save all the settings and take you back to the template manager view. If you have any more questions about how to use the control panel please open a support ticket at the website.